For five days, the city was home to the largest meeting of corrosion professionals, vendors, and educators, which focuses on preventing and mitigating worldwide corrosion. The technical strides made by corrosion professionals over the past 74 years were apparent during the hundreds of events—technical symposia, committee meetings, seminars and lectures, training opportunities, and social gatherings—that offered a multitude of cutting-edge technical and educational resources, public awareness activities, and networking opportunities that the corrosion industry has come to expect. All areas of corrosion control and mitigation were covered by symposia, technical meetings, forums, and student poster sessions, including oil and gas corrosion inhibitors, coatings, practical field application of cathodic protection, pipeline integrity, materials, testing and instrumentation, maritime corrosion, water and wastewater corrosion, and corrosion in nuclear systems. The Opening Night Reception on Sunday evening—a conference kick-off tradition—marked the ending of CORROSION 2019’s opening day in Nashville as attendees and exhibitors interacted over drinks and southern hors d’oeuvres, and had the opportunity to catch up with old friends and make new contacts after a day of administrative and technical meetings. Highlights during the week included the presentation by CORROSION 2019 Keynote Speaker Jack Uldrich, who discussed the Future of Emerging Technology. 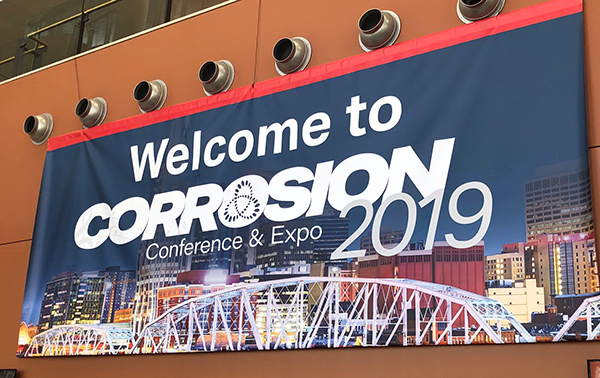 Once again, the Corrosion Chronicles Theaters in the Exhibit Hall hosted experienced corrosion professionals who presented interactive forums on a variety of corrosion-related topics. The interactive Leadership Forum, featured a panel of corrosion industry leaders, who shared stories and presented tools to help attendees enhance their own leadership skills and take the next step in their careers. It was a busy week and successful by every measure. NACE thanks the attendees, speaker, sponsors, and exhibitors for making this year’s event a huge success! We look forward to seeing you next year at CORROSION 2020 in Houston, Texas, USA. There is no single, universally accepted ISO or ASTM test method for qualifying coatings for CUI. To resolve this problem, CORROSION 2019 hosted a forum that explored one accelerated testing regimen for qualifying a costing system. A special social media demonstration for scientists and researchers will be held today in the Blue Theater (booth 2108). From 10:30 to 11:00 a.m., NACE International’s Social Media Manager, Janna Schulze, will be showing authors how to quickly and effectively promote their work through the use of tools available through CORROSION journal’s partner Kudos.